In this article we are going to learn about Ramsar convention, what is it all about, what are there objectives and functions, where are the Ramsar sites located in India and many more such things. So without any further ado, let’s begin. When you look at the word Ramsar, at first it might sound as if it is the name of a place in India. One can easily think of this name as an Indian origin. However, it is not the case. Ramsar is the name of a city in Iran. There was an International Treaty that was signed in 1971, it is about global conservation and sustainable use of wetlands. As of now, somewhere around ~170 countries are part of this treaty. And that’s how it is known as the Ramsar convention. A wetland is a place where the land is covered by water or is present either at or near the surface of the soil all throughout the year. 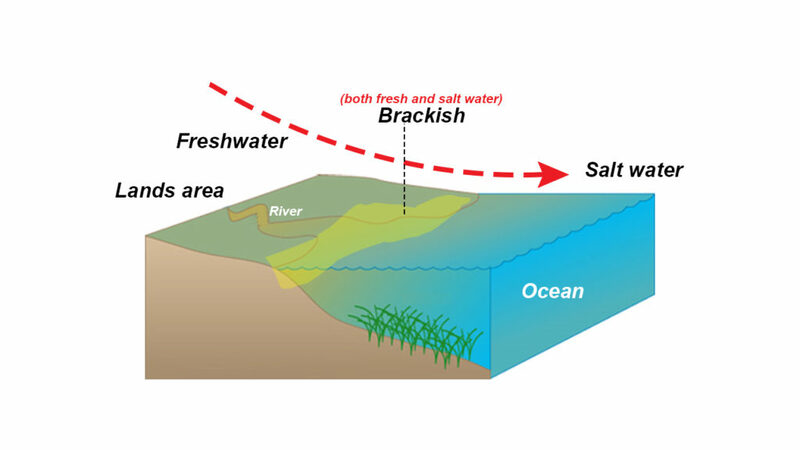 The moment you see a mixture of land and water, it becomes an intersection point between the terrestrial and aquatic ecosystem. Plus, wetlands have moisture all throughout the year. That means it is home to aquatic plants, insects, amphibians, reptiles, birds, fish, mammals, and many microbial bacterial communities. And that’s what makes the wetlands the most productive ecosystem in the world when compared to rainforests and coral reefs. Wetlands are usually found in low lying areas. They can be both natural and man-made. They can be coastal and inland. 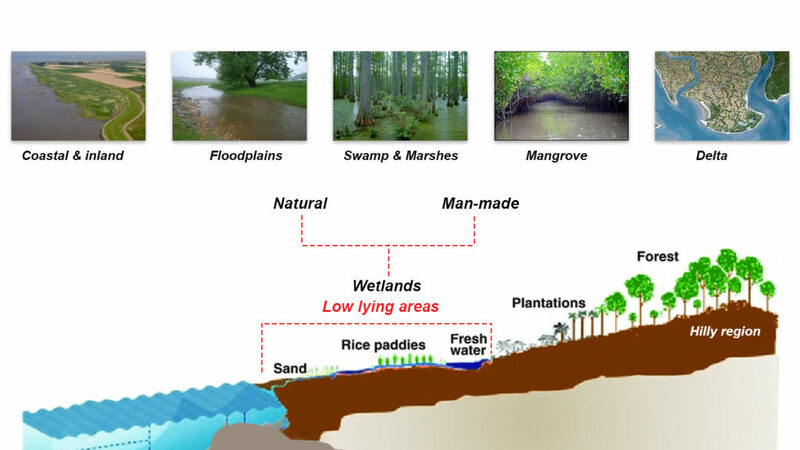 Floodplains, swamps, marshes, mangroves, deltas, and lakes are different types of wetlands. Even an agricultural field like a paddy field is a wetland. Wetlands can contain fresh water, salt water, or brackish which means both fresh and salt water. They provide habitat for animals and plants and supports a wide diversity of life. Many species of birds and mammals rely on wetlands for food, water, and shelter, especially during migration and breeding. It helps to recycle nutrients that are so important for many other surrounding ecosystems. wetlands are like a sponge. They absorb pollutants and improve the water quality by filtering out sedimentation, decomposing vegetative matter and converting chemicals into a usable form. It also helps in recharging ground water. Wetlands like mangroves also protect shores from any kind of flood at least it reduces the impacts of it by reducing the momentum of the incoming wind and water. Wetlands also reduce soil erosion and increase soil fertility. Therefore agricultural lands near the water area will not loose soil due to the presence of a wetland. Wetlands also provide livelihood sources to humans in terms of – Agricultural produce, Craft materials, timber production, Medicinal plants, Fishing, Hunting. How does this convention work? 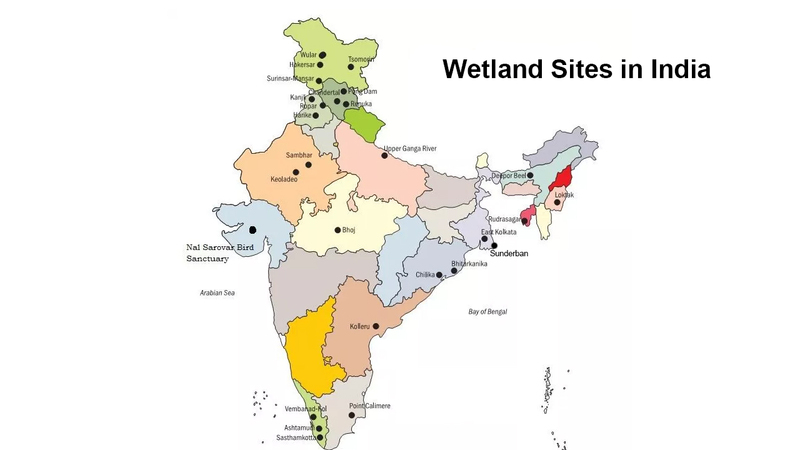 A country has to designate at least one of its wetlands into the list of wetlands of international importance which is also called a Ramsar list or Ramsar sites. It can later designate more such wetlands. Once a country is part of the Ramsar sites. Being a part of the Ramsar Convention, a country will gain access to the knowledge of how to conserve and make sustainable use of the wetlands. Some experts and officials from Ramsar advisory mission may visit the member country, analyze the situation and define how to tackle the threats. It also makes the member countries cooperate internationally on transboundary wetlands, shared wetland systems and shared species. One more important thing about Ramsar convention is that – it keeps a check on all the wetlands that are there in their list which is the Ramsar list. By check I mean, has there been any kind of ecological change in the wetlands due to climate change, human interference or any kind of improvement due to technological development. If at all there are any notable changes in the wetlands, the convention then updates or changes the Montreux Record. Montreux Record is a register of wetland sites where changes in ecological character have occurred, are occurring, or are likely to occur as a result of technological developments, pollution or other human interference. It is maintained by the Ramsar convention. 1. 02 Feb 1971 is considered as World Wetlands Day. 2. Wetlands exist in every country and in every climatic zone, from the polar regions to the tropics, and from high altitudes to dry regions. 3. Europe has the maximum number of wetland sites. The countries with the most Sites are the United Kingdom with 175 and Mexico with 142. 4. India became a member of the Ramsar Convention in October 1981 and designated Chilika Lake (Odisha) and Keoladeo National Park (Rajasthan) as its first two Ramsar Sites. 5. Bolivia has the largest area with 148,000 km2 under Ramsar protection. 6. The world’s first Site was the Cobourg Peninsula in Australia, designated in 1974. In J&K – Hokera Wetland, Surinsar-Mansar Lakes, Tsomoriri & Wular Lake. In Himachal Pradesh – Chandertal Wetland, Pong Dam Lake, Renuka Wetland (This is also the smallest wetland of India). In Punjab – Harike Lake (it is a manmade lake and was formed by constructing the head works across the Sutlej river, in 1953), Kanjli wetland & Ropar wetland. In Rajasthan – Keoladeo National Park and Sambhar Lake . In Gujarat – Nalsarovar Bird Sanctuary. In Madhya Pradesh – Bhoj Wetland. In Uttar Pradesh – Upper Ganga River (Brijghat to Narora Stretch). In Assam – Deepor Beel. In Manipur – Loktak Lake. In Tripura – Rudrasagar Lake. In West Bengal – East Calcutta Wetlands & Sunderban wetland. In Odisha – Bhitarkanika Mangroves & Chilika Lake. In Andhra Pradesh – Kolleru Lake. In Tamil Nadu – Point Calimere Wildlife and Bird Sanctuary. In Kerala – Ashtamudi Wetland, Sasthamkotta Lake, Vembanad-Kol Wetland ( it is the largest Wetland of India).